A Moment of Shocking Clarity: Honoring the Life, Work and Ministry of The Rev. Dr. Martin Luther King Jr. This sermon, offered on January 14, 2018 by the Very Rev. 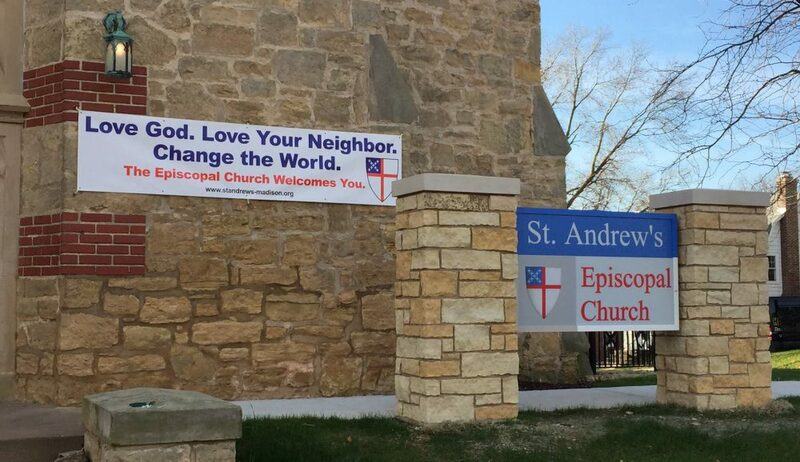 Andy Jones at Saint Andrew’s Episcopal Church in Madison, Wisconsin is built around the Lessons Appointed for Use on the Feast of Martin Luther King, Jr.
You can find those lessons here. May the words of my mouth and the meditations of our hearts, be always acceptable in your sight, O Lord, our strength and our redeemer. Please be seated. It catches us up short. Startling, sometimes even frightening us when it happens. We’re making our way through life. Maybe we’re not paying attention. Maybe we’re making excuses. Maybe we are in denial. But then a moment of clarity strikes us. Something happens and the truth becomes too obvious and to plain to ignore, and we have to finally deal with it. We had just such a moment here in this last week. Just a week ago, as we celebrated the Baptism of our Lord, we stood here in this place and we promised to seek and serve Christ in all persons, loving our neighbors as ourselves. We promised that we would strive for justice and peace among all people, and respect the dignity of every human being. All people. Every human being. That’s a tall task for anyone. It’s easy to love the people who love us, who look like us, who dress like us, who believe like us. But these vows don’t give us that option. We have to go beyond that and love all people, respect the dignity of every human being. Now we renew these baptismal promises all the time. Every time there’s a baptism in this place we stand and renew our baptismal vows. We do it when we celebrate the feast of the baptism of our Lord. But I wonder how many of us walk out the doors of this place really thinking about what those words mean… All people. Every human being. I think it’s possible that we walk around ignoring the implications, pretending that we haven’t said those words, or even in denial about the words all and every. And here we are today with this moment of clarity. Jesus tells us that we have to go beyond all of that, and love our enemies. It can’t be more explicit. It can’t be clearer. Love your enemies. And the difficulty of what we signed up for becomes absolutely, undeniably clear. Jesus even acknowledges that. He says anybody can love the people who love them. Anyone can do good for the people who do good to them. Anyone can lend money if you expect to get it back with interest. But you, you, we, God’s children, followers of Jesus Christ, are expected to do more! We are expected to love all people as we love ourselves and to respect the dignity of every human being. It’s a terribly difficult thing to do but it is our calling. So how do we, as the church, as followers of Jesus, accomplish these tasks? We spent some time this morning in the forum talking about ways to gather community, to draw people together, to make sure that people feel welcome and loved, so that we might link arms and work together to bring about God’s vision and dream for all of creation. And I think all of those are powerful witnesses and testimony to the narrative that we uphold. For a long time, I’ve held to that narrative as a chief way for us to love all people. To proclaim that countercultural narrative to the world; that we are all created equal, that we are all one, that we are all beloved of God, is to speak against the voices in this world and this culture that diminish, demean, and denigrate. I have thought that maintaining that narrative and proclaiming it was a great way to stand against the powers that the oppress, and dehumanize, and destroy God’s creatures. But I had this great conversation with a very wise person whom I respect very much this week, and that person helped me to recognize that in today’s world there are so many narratives being spoken, there are so many stories, there are so many ways to interpret this world, being promulgated through platforms that we might not have imagined twenty years ago, that it’s hard for that narrative to reach people. It’s hard for that narrative to stand out against all of the narratives that are being voiced, and people are holding, so we need to do something more. Because anybody can tell a story. So what is it that we need to do? I think that when we hear people speaking in ways that diminish, demean, and denigrate, we need to speak up in that moment. It’s not enough to acknowledge that those words are wrong. Anybody can do that. We need to take the extra step and say “No this is wrong!” We need to speak up against systems that oppress, and marginalize, and destroy God’s creatures, and say that those systems are wrong. We need to make sure that all of God’s children have what they need to flourish, and to be whole. We need to work for reconciliation! So when we see that there are systems in place that aren’t upholding that dream and vision for creation that God has entrusted to us, we need to work for change, to lobby for policies that uphold us all. We need to carry our values, and our belief, and that narrative, into the voting booth. We need to stand up and proclaim by word and example the good news of God in Christ and no wait for someone else to take action on our behalf. Today we are using the proper’s that are assigned for the celebration of the life and ministry of the Rev. Dr. Martin Luther King who was assassinated for daring, for daring to take action against these very systems, and these very words, fifty years ago. We may have told ourselves in the past years that we have come a long way. And that may be true. But we are in danger of sliding backwards. The narrative that we uphold is being over shadowed, and it’s not being proclaimed in ways that are effective. And so we, we, each and every one of us, this community here in this place, this city, this nation, needs to speak. To speak. To name what’s wrong when we see it. To hold up what is good, and right, and life-giving. To seek and serve Christ in all people, and to love our neighbors as ourselves. We, we need to be active and strive for justice and peace among all people. And respect the dignity of every human being. It’s hard, it’s scary. And we may have spent a lot of time in denial, and ignoring that responsibility, but my brothers and sisters this is what we have promised to do. As followers of Jesus Christ, we have promised to walk in his footsteps, and to walk in the footsteps of prophets like the Rev. Dr. Martin Luther King, and call for peace and justice, for equality, for life giving systems and policies that govern and rule us in this community, and in the nation, and in the world. Tomorrow at the capital we’ll celebrate. We’ll sing songs. We’ll hear powerful speeches. And we’ll remember something that happened a long time ago. But if we don’t step into that vacuum and continue that work, then that celebration is hollow. If we don’t step into that vacuum and continue that work, then what we’re doing here this morning is just as hollow, because we are called to hard work. We are called to do more and everybody else around us. Because we’re not allowed to opt out of the promises that we have made.